Motion® binax and Insio™ binax models have the same directional performance as the Pure binax and Carat binax. * See legal note on back cover. Yet another world first from binax. OneMic directionality is fully automatic with minimal power consumption. New features for all binax products. binaxSound, and binaxGuide. And the best part is, they are also available for our existing binax models. of the acoustic environment: We call this “High Definition Sound Resolution” or HDSR. e2e wireless 3.0 virtually doubles the microphones and creates HDSR. 3.0 creates a virtual eight-microphone network. 3.0 creates a virtual four-microphone network. individual wearer – raising the bar for Soundability. Hearing that’s more precise – in all situations. challenging listening environments more easily. with normal hearing. * It does this while preserving spatial perception and without compromising battery life. * See legal note on final page in this document. Features in harmony for the best audio output. spatial perception or speech intelligibility. so speech is always audible. Hearing has never been so individual. cocktail parties or in windy situations. prefer a natural therapy signal over synthetic tones. The world's first directional CIC and IIC. demanding environments, even better than normal people. controllable via the touchControl App. For more details, please see pages 8 and 34.
provides a high level of amplification to cover more severe hearing losses. exceptional performance with true binaural capabilities. For more details, please see page 10.
thread for the new ThinTube or redesigned earhook. For more details, please see pages 52-55. Now available for all binax hearing instruments. controllable via the free touchControl App. include 7bx, 5bx, and 3bx performance levels. The first directional CIC and IIC. a virtually invisible solution with outstanding audiological performance. Tinnitus therapy feature only or mixed mode. performance as Pure and Carat RICs. true binaural capabilities to fit any ear. and intelligent interface offer wearers hassle-free handling and connectivity. sophisticated binaural features in binax. Motion SX and PX binax models overnight. Accessories, see pages 47 – 48. BestSound Technology further enhances the new Ace binax’s level of discretion. have to choose between discretion and convenience – now they can have both. Ace binax. Now more discreet than ever. volume, and treble can be discreetly changed. Also available as flat cover. S, M, P and HP. † See legal note on back cover. miniReceiver 2.0 HP. See details on page 51.
technology in an elegant design. hearing. * And it does this without compromising battery life. Pure binax. Discretion meets a new dimension of hearing. easyTek App, or the touchControl Apps. different lengths and power levels S, M, P and HP. *,† See legal note on back cover. Carat & Carat A binax. flexibility in a compact design. connectivity, and longer battery life in a compact design. Carat binax. 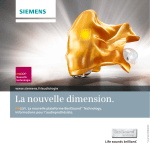 Flexibility meets a new dimension of hearing. easyTek App, or the touchControl App. charges and dries Carat binax overnight. For program and volume adjustments. with a connection for direct audio input. A) Not for Ace binax. B) Only for hearing aids with one microphone each. C) Only for hearing aids with two microphones each. rechargeable, and cover practically all levels of hearing loss. Pure micon. Perfectly equipped for effortless interaction. See page 64 for available colors and page 46 for compatible accessories. offer the convenience of rechargeability. And all Motion micon models are IP67-rated . Motion micon. Superb sound meets outstanding comfort. Waterproof, robust and more powerful than ever. nothing to the tough and durable Aquaris micon – perfect for anyone who wants to enjoy life without limits. Aquaris micon. Lets sound in, not the elements. placed in the aquapac and used while swimming. Maximum power for maximum gain. Sense of hearing meets sense of style. Life micon fits virtually every user right away. It is simple, convenient and reliable. 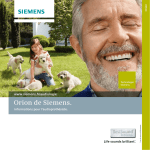 Siemens Life micon. The small work of art that’s big on style. Engineered for absolute comfort and discretion. wearing comfort, outstanding listening satisfaction and increased understanding from the start. Insio micon. Live your individuality. CONNEXX 7.3 the data is automatically read out. The result: A faster, easier First Fit. can use it whenever and wherever you need it. The comprehensive advisory tool with practical functions. Scan the QR code that links to the Siemens app webpage. the Google Play Store or Apple App Store. using their hearing instruments in real life situations. outstanding service with this proven tool. Auditory training for improved listening competence. Turn even your most skeptical patient into a delighted wearer. fittings. Enhancing these facets of service increases patient satisfaction – and business success. then addressed with ProSuite’s comprehensive tools. or in real world listening situations. is modular so choose only what you need. Siemens website and on YouTube. available under the ProSuite tab. he eCharger hearing aid batteries.regular batteries. their own pace, and at their convenience. and the benefits of hearing instruments. life has in store for your patients. intelligibility – even in noisy environments. want to miss out on the action in their lives. Sirion. With great comfort and versatility. in sound from all directions. Full control at your patients’ fingertips. instruments and can be downloaded for free on the Google Play Store or Apple App Store. Play Store or Apple App Store. microphone, or other audio sources directly to wearers’ instruments. audible. easyTek is universally compatible with all available FM systems. * Compatible with Android and iOS. Turn smartphones into a hearing aid control center. and convenient companion to your binax hearing aids. and show your customers that their care is in the best hands. Scan this QR code to download the binaxDemo App. Configurator Span in your smartphone app. while suppressing the sound from other directions. return to the automatic program. professional can show you how. school-age children, teens, and young adults are especially important. Siemens offers solutions that meet the changing needs of young ears. for active kids and teens. These discreet solutions feature trendy technology for tech-savvy teens. For more details, see paged 10-17.
in a discreet, custom option for the conscious teen. For more details, see pages 8-9.
for action-loving kids and teens. amplification for those who need it most. The robust partner for action-loving kids and teens. For more details, see page 27. For more details, see page 28.
risk of damage or choking on small parts. with a built-in audio shoe. Protect sensitive ears from water. sensitive ears from irritation or infection caused by water in the ears. like turbine or engine sounds occurring during flight. Protect your ears while shooting or hunting. sudden “impulse noise” coming from a gun. Small and discreet with natural sound quality. as a spectator or a musician in a band. wearer can also receive cell phone or CB calls at any time thanks to the integrated T-coil. and iScan digital ear impression scanner allow for utmost accuracy and ultra-fast turnaround. audio streamers, audio streamer accessories, remote controls, and charging stations. Remote controls, eCharger, and DAI. 7bx, 5bx, 7mi, 5mi, 3mi, Orion. For every generation of BestSound Technology, Siemens offers a wide range of miniReceivers for every requirement. instrument using the HP custom order form. Click domes and click molds. more loudness than the open dome can offer. maximum comfort and no occlusion. broadband amplification and more retention. Can also be used with a miniReceiver size P.
Click Molds are an alternative to fitting with Click Domes. The new HF4 Pro filter. HF4 Pro filter is clogged and needs to be changed is doubled – and receiver related repairs are significantly reduced. find out about the right size for the wearer’s custom hearing aids. rising to the challenges of everyday life. ThinTube – for a secure fit and optimum sound transmission. quickly and easily screwed on or off. ThinTube is straight on the screw thread. fully tightened in the screw thread. fit and optimum sound transmission. demonstrating binax’ features or improved handling of microphone settings. your services. Connexx supports this by enabling use of the binaxDemo App. pleasant, comfortable fitting experience with more precise results. onwards for the fastest possible individual fitting. system which provides modularity in a timeless design: A long-term solution. are interested in the complete portfolio. Grey flexible demo ear incl. 17X22 poster that fits in snapframe. Detailed feature overview RIC and BTE. Color overview RIC and BTE. All sizes at-a-glance – RIC and BTE. individual cases and are subject to change without prior notice. to people with normal hearing. dust will not interfere with the satisfactory operation of the device. the device. Requires appropriate earmold for submersion. Inc. and any use of such marks by Sivantos GmbH is under license. "GORE and designs are trademarks of W. L. Gore & Associates"
instrument can solve every hearing problem nor restore normal hearing. Copyright © 2015 Sivantos GmbH. All rights reserved. Sivantos GmbH is a Trademark Licensee of Siemens AG.